You can not convert the characters in the document of image PDF to XLS file directly with common document converter there doesn’t contain OCR technology. If you want to resolve this kind of problem, the application VeryPDF PDF to Excel OCR Converter will help you. With Optical Character Recognition technology inside, PDF to Excel OCR Converter is able to recognize six kinds of languages in image PDF document and convert them into editable XLS format file accurately. 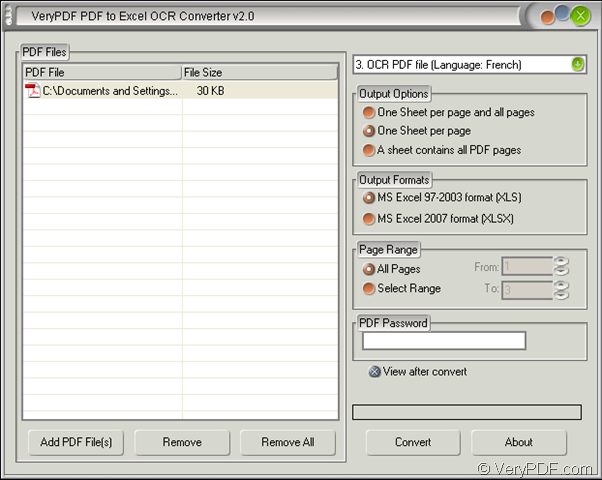 If you want to try the application, you are recommended to download the free evaluation version of PDF to Excel OCR Converter at www.verypdf.com/dl.php?file=verypdf2excelocr.exe and please set up it on your computer by double clicking the setup file and following the installation wizard popup. There are three steps in the conversion from image PDF to XLS. The first step is to add image PDF document into the opened interface of the application which is shown in Figure 1. 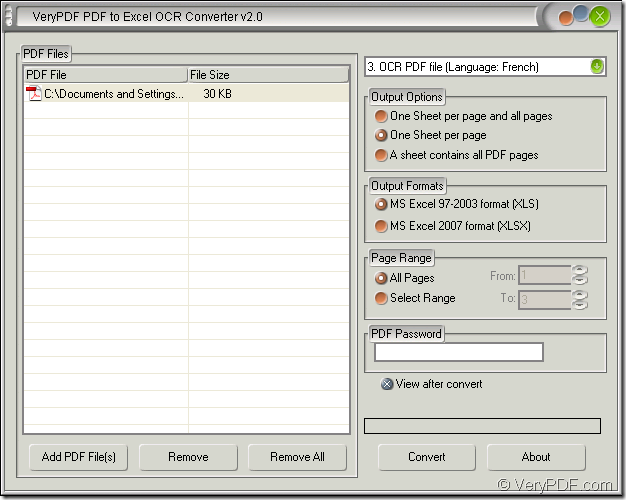 You can directly drag and drop the image PDF document from its folder to the file list of PDF to Excel OCR Converter. Or you can click “Add PDF File (s)” or right click the file list and click “Add files” in floating item to open “PDF to Excel” dialog box in which you can choose PDF document to be converted and click “Open” button to add them. 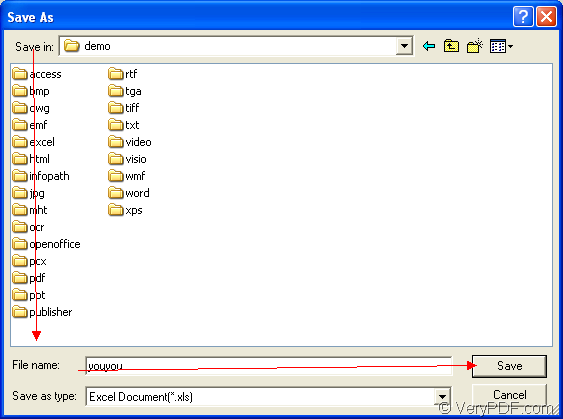 The buttons “Remove” and “Remove All” are used to delete the PDF document in file list one by one or one-off. The second step is to set necessary parameters for the target file. If the language in the image PDF document is French, please choose the third option “OCR PDF file (Language: French)” from the right top dropdown list. In “Output Options” group box, you can choose output layout for the generated XLS file. In “Output Formats” group box, please choose “MS Excel 97-2003 format (XLS)” option. The last step in the conversion from image PDF to XLS is to save the target file and run the conversion. Please click “Convert” button to open “Save as” dialog box which is shown in Figure 2. In “Save in” dropdown list, please choose the output location for created XLS file. In “File name” edit box, you need to input the name for output file. Then please click “Save” button to run the conversion from image PDF to XLS. You will see the interface of PDF to Excel OCR Converter again and a progress bar will appear to remind you the conversion process. Several seconds later, the conversion will come to the end. If you want to browse the target file at the first time when the conversion is over, you can check the option “View after convert” in the interface of the application before running the conversion. There are five kinds of licenses of PDF to Excel OCR Converter given for different kinds of users. If you need any one of them, please visit the homepage of the application to purchase it: http://www.verypdf.com/pdf-to-excel-ocr/index.html. This entry was posted in OCR Products and tagged image PDF to XLS. Bookmark the permalink.